21 July:The debate on the UPA’s Government vote of confidence motion began on Monday with the best speakers in the country’s politics speaking for and against the Indo-US nuclear deal. Prime Minister Manmohan Singh began the debate on the trust motion by praising the "visionary leadership" of Left leaders Jyoti Basu and Harkishen Singh Surjeet. BJP leader L K Advani said the deal must be re-negotiated.Foreign Minister shot back, the deal was the best in the present form. Commending the motion, the Prime Minister said he had assured all political parties including the Left that the government would come to Parliament before it approached the US after clearance from International Atomic Energy Agency and Nuclear Supplies Group. Earlier, Giving a thumbs up sign, Prime Minister asserted that his government will win the vote of confidence in the Lok Sabha. Arriving at Parliament House, Prime Minister waved at the waiting news camerapersons and indicated a ‘V’ sign before entering his office there. With Speaker Somnath Chatterjee brushing aside his party’s demand for his resignation and presiding over the proceedings, Singh moved his one-line motion "that this House expresses its confidence in the Council of Ministers". Twelve hours have been allotted for the debate and the voting is expected on Tuesday evening at about 6 PM after the Prime Minister’s reply. Singh, who before entering Parliament expressed confidence that the UPA government would prove its majority on the floor of the House, made a brief speech in which he did not speak on the merits of the Indo-US nuclear deal over which the Left parties withdrew support necessitating the trust vote. Moving the motion, he said for the past couple of decades the country was used to governments being forced to seek a vote of confidence within months of coming to power. "I regret that this session of parliament has been convened when the attention of the government has been on the economy, particularly on the control of inflation and on implementing programmes for the welfare of our people, particularly our farmers. This exercise, I submit sir, was wholly avoidable," he said. "I assure the House and the country that every single decision, every policy initiative we have taken was in the fullest confidence that we are doing so in the best interests of our people and our country," the 75-year-old leader said to the thumping of desks by the ruling UPA MPs. The Prime Minister’s opening speech was heard by a full House with leaders of both the ruling coalition and the opposition, including Sonia Gandhi, Pranab Mukherjee and L K Advani, following it in rapt attention. In a veiled dig at the Left parties, which withdrew support forcing the confidence vote, Singh said if the government was here after a tenure of four years the credit for this should go to the leaders of the UPA including Sonia Gandhi and to the "wise and visionary leaderships of Jyoti Basu, Harkishan Singh Surjeet and M Karunanidhi". "They were all the architects of our coalition government. It is their wisdom and sagacity that has helped me and our government function for these four years," he said. He said the intimation of withdrawal of Left parties’ support came when he was in Japan and as soon as he came back he met the President and offered to submit himself to the vote of confidence in Parliament. "Sir, I seek the support of this House today on the basis of our entire record in our office over the past four years," Singh said adding, "I have no doubt that the people of India, when they consider what we have done, will reaffirm their confidence in us, in our government." Tracing the events leading to withdrawal of support, Singh said he had given an assurance to all parties including the Left that if the government had been allowed to complete negotiations with the IAEA and the NSG, he would himself come to Parliament for "guidance" before operationalising the deal. Leader of the Opposition L K Advani, who took the floor immediately after the prime minister, and CPI(M) leader Md Saleem attacked the government over the way it went ahead with the nuclear deal. Advani accused the government of misusing democratic institutions to convert itself from "minority into majority". The BJP leader said the prime minister was "singularly" responsible for the present crisis and held that the Indo-US nuclear deal has become an agreement between two individuals, making India "subservient" and a "junior partner". He made it clear that the BJP, if voted to power, would not scrap the deal but would renegotiate it. "UPA is like a patient in the ICU room. The first question everyone asks is whether he is going to survive or not," Advani said opposing the trust vote in his speech which was repeatedly interrupted by the ruling side. Advani complained that the draft text of the safeguards agreement was described as "privileged" and "classified" but was circulated to IAEA members first and the House was denied an opportunity to go into it. He claimed that after the Pokhran II tests the Prime Minister had said that it was not in national interest to have India as a nuclear weapon state, but the statement was objected to by Singh. The Prime Minister made a brief intervention in which he said that when he spoke in the Rajya Sabha in 1998, he had stated that "we are all opposed to sanctions and we must prepare our country to face the challenge of sanction". Twitting Singh on his status as a Rajya Sabha member, he said it would be an irony that a prime minister would not be able to vote for his confidence motion for the first time. Leader of the House Pranab Mukherjee quickly interjected to point out that the then prime ministers I K Gujral and H D Deve Gowda also did not vote on their motions of confidence. Prime Minister Manmohan Singh has denied that he had opposed the Pokhran-II nuclear tests in 1998. 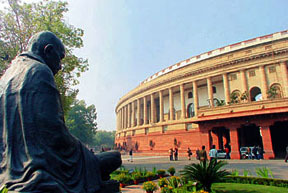 Intervening in the Lok Sabha during the debate on the confidence motion, he said he had criticised the government in the wake of sanctions on India following the tests. Singh said he had also made the comments on the nuclear tests in the context of non-proliferation goals that India had put forward in the UN in 1988.Earlier, Leader of Opposition L K Advani had said Singh, as Leader of Opposition in Rajya Sabha in 1998, had opposed the Pokhran-II tests. Singh said the records could be gone through to check exactly what he had said.Advani also referred to the "sharp exchanges" Singh had with a BJP leader in the Rajya Sabha. The Prime Minister said the exchanges were in context of the sanctions.